Expand your potential with "Innovation and Leadership: Breakthrough Strategies for Uncertain Times." This premier educational event for businesswomen in Silicon Valley features MSNBC commentator Rachel Maddow; NPR and ABC veteran news analyst Cokie Roberts; and best-selling author/sociologist Dr. Bertice Berry. 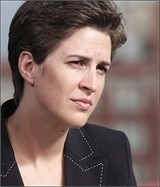 Speakers: Rachel Maddow, host of MSNBC's "The Rachel Maddow Show"
Careers of the Future: Which One is Right For You?